This summer, rising Emory senior Jeff Than helped disadvantaged middle school students broaden their horizons all the way to outer space. Rising senior Emilia Truluck stepped away from her small-town roots to engage in research with the Middle East Division of The Carter Center’s Conflict Resolution Program — scholarship that could one day help promote peace in Syria. Trombone in hand, rising senior Kevin Williams found himself immersed in daily life and death issues at Hospice Atlanta’s residential center, while rising senior Angel Hsu helped refine a test that could help pinpoint a liver fluke infection that attacks millions of people throughout the developing world. And most nights, they brought their work home with them, gathering around a dinner table — as both scholars and housemates — to discuss their experiences through a living-and-learning program that affords a deep, personal exploration of social justice issues. 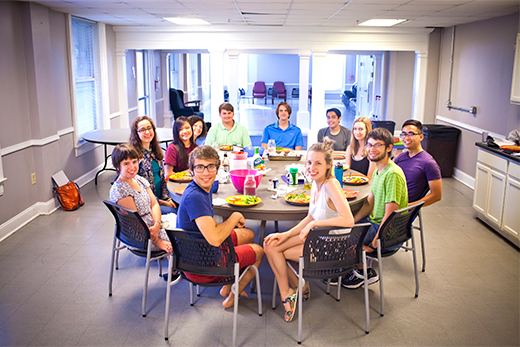 In some ways, Emory’s Scholarship and Service (SAS) Summer Program functions like a petri dish: Put bright young minds together in a shared housing environment; expose them to social concerns that stir individual passions; mix in targeted field trips, readings and inspiring speakers; and see what grows. During weekdays, students fan out across Atlanta, participating in internships with a variety of organizations. In the evening, they reconvene at a fraternity house along Eagle Row, vacated for the summer, where they prepare dinner together and rehash experiences. There, ideas and insights are shared and dissected, argued and challenged in a far-reaching forum that is part table talk, part peer-driven classroom. It’s an evolving dialogue continually shaped by scholarship and self-discovery, says Christine Ristaino, senior lecturer in French and Italian, who serves as a faculty adviser to the program. The SAS Summer Program is available to Emory Scholars and was developed by longtime Emory administrator and faculty member Bobbi Patterson during her tenure with the Emory Scholars program. "They’re amazing students who have so much to say, have really thought about social justice issues, and now want to put it all into action — not just for the sake of volunteering, but to help change the world," Ristaino explains. As a double sciences major in chemistry and neuroscience and behavioral biology (NBB), Than doesn’t often have opportunities to delve into social justice topics — his time is largely divided between books, labs and his job as a Senior Resident Assistant with campus housing. For nearly two months, Than worked at an academic camp run in partnership with the National Aeronautics and Space Administration and the Massachusetts Institute of Technology designed to help pre-teens produce computer coding that could be sent to the International Space Station for a trial run. It’s all part of his internship with a Graduation Generation-Atlanta program aimed at introducing students at Harper-Archer Middle School to both role models of color and STEM careers. "Walking into that classroom the first day, the kids were intimidated," he recalls. "But over the weeks, they started becoming more interested in space, in physics and in the programming." "And the kids were really bright — they knocked me off my rocker," says Than, adding that their coding not only won a regional contest but is bound for national competition. As executive director of Volunteer Emory, Rohin Aggarwal already had a record with service work, from tutoring non-English speaking students and planting trees for Trees Atlanta, to packing medical supplies destined for developing nations through MedShare. In time, his interests began to merge. "It was obvious to me that I wanted to incorporate public health into my career with a social justice link," he says. That’s how Aggarwal ended up at the U.S. Centers for Disease Control and Prevention’s Agency for Toxic Substances this summer, working on a project that examines how chemicals used in controversial hydro-fracturing procedures affect both the environment and human health. "It’s been eye-opening to see how public health works from a policy standpoint," says Aggarwal, a rising senior in chemistry and music performance. But equally important has been the experience of living among like-minded social justice scholars, he says. "All nine of us have completely different backgrounds, but in the end there is a common goal," Aggarwal adds. "At the most basic level, that is to create positive change." Samantha Stevens 15C was a SAS scholar in 2012, but returned this summer to serve as an on-site program assistant. "I call myself the house grandmother," quips Stevens, who works with refugee farmers in Atlanta as in intern with the Global Growers Network. "SAS was probably the most significant experience I’ve had at Emory, as far as directing my career toward social justice," she says. "I came from a small town in Georgia and had never really had conversations about race, gender and equality — I came to Emory not really knowing what I wanted to do. SAS really changed everything." Stevens first worked for a nonprofit that advocates for survivors of domestic violence and human trafficking — an experience both illuminating and unforgettable, she says. "For me, it was more than an introduction into the world of social justice," she recalls. "It influenced my decision to major in Latin American history, which can offer a gateway into social justice work within the immigrant community." Before coming to Emory, Truluck was already drawn to international diplomacy. But a summer internship with the Syria Transition Options Initiative at The Carter Center found her combing Arabic and English-language manifestos in support of real-time peace work. "My focus was on compiling and analyzing data to determine where some organizations might have agreement and disagreement about transitional governance," says Truluck, who is majoring in Middle Eastern Studies and Women’s, Gender and Sexuality Studies. Beyond the thrill of knowing her research might one day help shape post-conflict governance in Syria, the experience refined her academic aspirations. "Through the SAS program — our readings and field trips and speakers — I’m discovering that I really do care most about people who are displaced by conflict," she says. "That’s a focus I want to maintain." For Williams, an opportunity to study death from different viewpoints through the Emory Tibetan Mind/Body Sciences Summer Abroad Program drew him to an SAS internship with Hospice Atlanta this summer, where he found playing his trombone for hospice patients could open doors into deeper, life-changing conversations. As a hospice intern, "every day I make sure I have some time with patients, to talk with them about whatever they want to talk about," says Williams, who is majoring in music performance and NBB, with an interest in medical school. "When a patient dies, do you see that as a failure of health care? An opportunity to enhance the quality of life?" he says. "There were so many things I wanted to understand." Now, he has a better understanding of not only the teamwork and personal touch required of hospice care, but the ethical complexities that can arise. "I expected it to be hard — I honestly wasn’t even sure I was ready for it," he says. "But I decided that if I couldn’t handle it, maybe I was looking at the wrong profession." On a recent Monday night, the SAS scholars gather around the dinner table with Emory alumnus and social justice advocate Ernest Brown 13C, who arrives with a challenge. How could the Martin Luther King Jr. Day of Service be more than a day of community clean-up? Could it be expanded to include a social justice action? A project that solves a social problem? 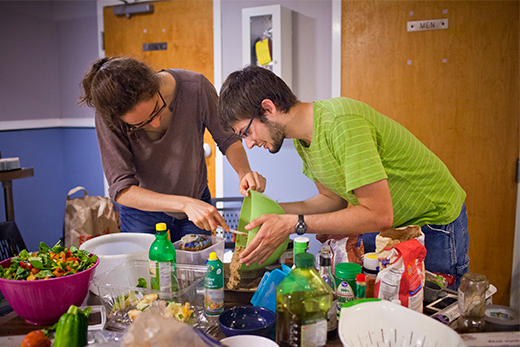 The meal was prepared by housemates — complete with homemade banana pudding — and the conversation is thoughtful, lively and peppered with multiple perspectives. Talk often references field trips, including places such as the Stewart Immigration Detention Justice Center; Habitat for Humanity Global Village; Grady Hospital; The Chattooga Conservancy; and the National Center for Civil and Human Rights. "This is a space that fosters intellectualism," explains Stevens. "You learn things about social justice and the community that you wouldn’t if you weren’t living together. It’s not just about intern experiences; it’s also about life experiences." And in the end, that’s really the point, says Ristaino. "Working at internships that can be challenging, asking questions and seeking perspectives — it all catalyzes personal growth." That’s been the case for Truluck, who says she leaves the SAS program "feeling that everyone has laid the groundwork for something bigger." Aggarwal agrees. "The greatest part of this is that you never forget why you’re here," he says. "And that gives me hope, knowing there are people out there who care and want to make a difference."